From one indie game covered yesterday to another! Today we look at The Girl and the Robot from Flying Carpet Games. It originally released on the PC last year, but this review takes a look at the recently released Wii U port. Let's check it out, together! This fairy tale doesn't quite have a happy ending. The Wii U started out with some promise, but as we all know, the system fizzled out rather quickly. The big third-party developers quickly passed on the system, but indie devs who crowdfunded their projects on Kickstarter for Nintendo's platform didn't really get much of a choice to disappoint those who funded their works. Many indies who planned their games on the Wii U were fortunate to release their titles before the Nintendo Switch caught on with the public like Beanie Babies in the '90s, therefore having an audience still on the Wii U for them. Other developers weren't so fortunate -- and through no fault of their own. The Girl and the Robot is one of these games, and this indie game just missed the Wii U audience that mostly has moved on to the Switch or left the Wii U in general. Should those that moved on take out their dusty Wii U GamePad or Pro Controller and play The Girl and the Robot? Seeing the girl and the robot together is really heartwarming. The Girl and the Robot is a dual protagonist game, having players take the role of none other than the eponymous girl and robot. The girl can do things like climb up certain walls and crawl through tiny spaces, but she has no means to defend herself. If an enemy marches up to her, they will automatically capture her, resulting in an automatic game over. 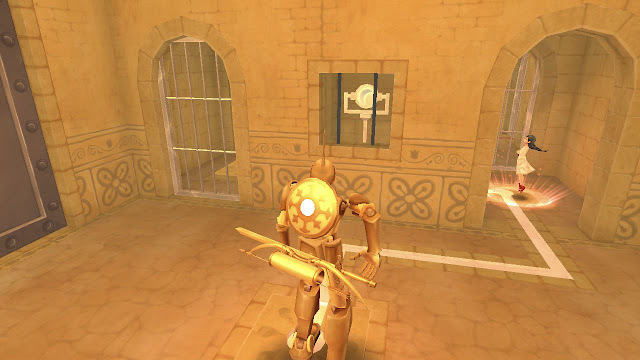 Meanwhile, the robot can attack enemies with his sword as well as fire arrows to attack both mechanical creature and switches alike. Thus, where the girl has the mobility, the robot has the offense, and the two need one another to progress through the castle in the sky where the girl was once imprisoned. The execution of how the two play off of and require one another to progress through the sky prison is handled well. 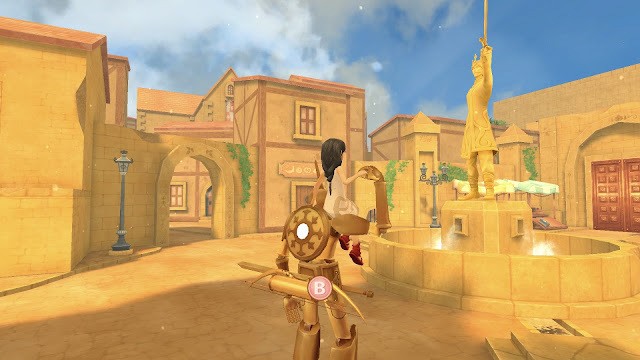 You can easily switch between the two characters with a press of a button, and the robot can even pick up the girl, having her riding on his shoulder to transport both around at once for convenience's sake. The puzzles that the game unleashes onto players aren't anything too wild or out of the ordinary. You have switch puzzles, box-pushing puzzles, pressure plate puzzles -- the list goes on. While those wouldn't normally turn heads or impress by themselves, how they're done by switching between the two playable characters effectively is what had me taken aback at times in wonder. An example of one of many puzzles in the game where working together is the only way to move forward. Where The Girl and the Robot succeeds in its puzzles and exploration, the game ultimately fails with its combat. What you're dealing with when playing as the robot is much like trying to play the game as The Wizard of Oz's Tin Man, who wasn't much of a flexible character at all, if you remember. Sword combat is unsatisfying at best, having the robot's weapon sloppily swing around at enemies with no hint of substantial impact with the foe it's fighting. Movement is also a problem, feeling supremely stiff and sluggish. Turning feels like our robot friend needs a severe oil change, as it's also quite slow. Bow aiming became my preferred method for engaging enemies, when possible. Some might have an issue with needing to stand still when aiming and shooting, but as a fierce fan of Resident Evil 4 (one of my favorite games of all time, as many longtime followers of me know) it didn't bother me in the slightest. Please stay back! 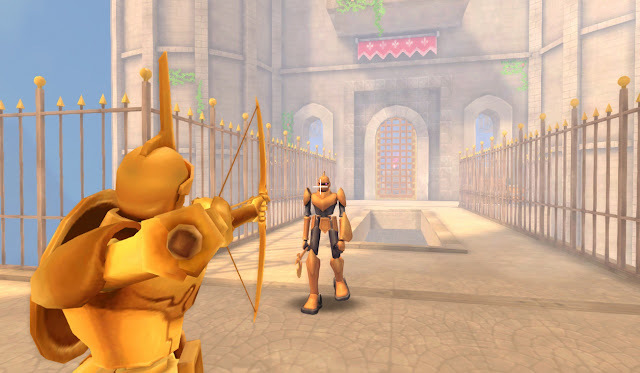 I prefer to use my bow because the sword combat and robot movement aren't very good! The major problem with the combat is that it's something I struggled with even early on in the game, and as it progressed, the combat scenarios only got more challenging, and thus, more frustrating to contend with. In a game I'm otherwise enjoying, it certainly stunk to go through The Girl and the Robot playing a fun part of the game while constantly, absolutely dreading that the next section would be a combat-intensive one. Thankfully, after engagements where your robot WILL take lots of damage, the girl can always heal it to full health. Otherwise this game might have been wholly impossible for me. 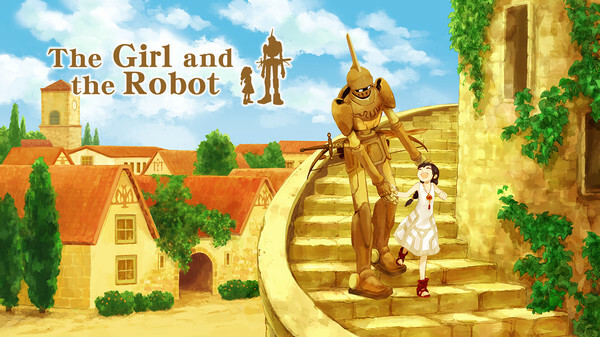 The Girl and the Robot uses a fairy tale style with its art and presentation. What would be very unimpressive with just its basic textures, its visuals are made better with the game's use of water-color coated visuals. However, despite its empty and barren areas, the game still manages to suffer from frame-rate problems. Some more time in the oven to slick up the game with some more polish would have been greatly preferred. On the sound side, sound effects are lacking in either sounding poorly or just being missing altogether. That said, the music flourishes that come in every now and then and the soundtrack itself leaves less to be desired and is quite good. While no doubt the developer wanted the Wii U port of The Girl and the Robot out as quickly as possible to not languish with limited sales on a system most have already moved on from (if they were ever there), some more polish would have been beneficial to the port. The lack of off-TV play (unless it's really hidden in there on how to activate it) was a severe bummer, and simply controlling the robot was a less thrilling prospect -- especially in combat -- than I would have liked. Overall, The Girl and the Robot is an interesting game with a heartfelt tale to tell, but it's tough to want to see it to the end when the obstacles are some gameplay and performance frustrations. Review copy provided by Flying Carpet Games.